Ferries to the Channel Islands from England - Check and compare fares and book ferries to the Channel Islands securely online. British and French tourists enjoy experiencing the distinct cultures and history of each of the Channel Islands. Jersey, Guernsey, Alderney, Sark, and Herm, all boast potential sunshine throughout the year on their sandy beaches and Guernsey (the second largest island) includes a high plateau—Haute Pas—which provides a view of the entire island. The activities enjoyed on the Channel Islands for holiday travellers include everything from jet skiing to skydiving, or a relaxing day at the beach.Ferries from the UK coast to the Channel Islands provide easy access for visitors whether they are on foot or taking their car over to tour the area. Condor Ferries provides five crossings a day taking an hour between Guernsey and Jersey, and four reverse crossings. Six times a week their ferries travel from Portsmouth to Guernsey and from Portsmouth to Jersey. Three crossings a week go from Poole to Guernsey; the trip from Poole to Jersey runs seven times weekly.From Weymouth to Guernsey, Condor Ferries travel twice a day. Twice daily crossings also go to Jersey. Their ferries run between Jersey and Guernsey as well. Island-hopping to experience all the wonders offered is easy using ferries, especially between the two main islands.Manch Isles Express is the other main ferry company servicing the Channel Islands. Their services leave from Guernsey and Poole. They provide ferry access to the smaller islands as well leaving from St. Helier (on Jersey) to Sark and Alderney. 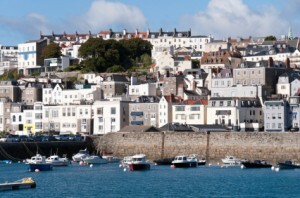 The ferry services have increased the Channel Islands’ popularity with holiday travellers in recent years.While visiting Jersey, include the capital St. Helier with independent boutiques and major “high street” stores. The fact that the islands have no VAT makes them ideal for shoppers. Travellers enjoy the ambiance of the local fish markets and the cuisine at local restaurants celebrating the day’s catch. The islands were the only British soil occupied by Germany during World War II. Jersey was the site of a concentration camp during the war which is commemorated through exhibits at the Occupation Museum. The Jersey Museum displays prehistoric evidence found that wooly Mammoths lived there at one time.Beautiful meadows surround an exquisite bird sanctuary: Le Petit Pré on Guernsey. Another popular tourist site is Castle Cornet, an 800-year-old fortress with an extensive historic significance. All the Channel Islands hold remnants of the time when William the Conqueror brought them into the Duchy of Normandy making a visit like travelling back in time.